MORE TO LIFE THAN ROMANCE? REALLY? There’s more to life than romance. An odd statement coming from someone who writes romantic suspense novels, but the truth is the truth. We can’t survive on romance alone. We all need connection with other people in all sorts of different relationships—not just romantic relationships. BETRAYED, the second in my Sisters by Choice series, just released. So, why did I choose the name Sisters by Choice for the series, especially when they are romantic suspense? As in life, not everything is about the romance! For many people, their friends are more important in their daily lives than their family. With families scattered from one end of the country to the other and even in other countries, the friendships we form often replace the family bonds from past eras. Sure, we still love our families but if they aren’t nearby, it can make for loneliness and feelings of isolation—if we let it! But we don’t have to let it and that’s what I wanted to show in the Sisters by Choice series. Family isn’t just blood, it’s about the bonds we form. Those bonds are formed as we go through life together and help each other. We can be there to help others during their crises and as we do emotional bonds will form. Those bonds can take strangers, acquaintances, and even friends, and transform them into family. That’s what I want to show in my Sisters by Choice series. Women who are willing to help others in their time of crisis. Women who will go the extra mile—take the extra time—use the extra energy to help another woman in need. BETRAYED, the second in my Sisters by Choice series, just released. The first in the series was DECEPTION, which is about a pair of estranged twins. As Patti searches for her twin, she forges an unlikely bond with the wife of a terrorist. As they do, they become family to each other. And we all need family—whether it’s by birth or by choice. 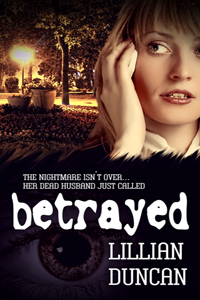 To celebrate the release of BETRAYED, I’m giving away a virtual gift basket at Tiaras & Tennis Shoes at www.lillian-duncan.com. The virtual gift basket includes e-copies of all my books. Along with the books, a $25 Amazon gift card is included plus a few books from some writer friends. To enter the contest, leave a comment on this post or any of the posts related to BETRAYED. To earn an extra entry, tweet this post, share it on FB or any other social media site, then let me know in the comment. Can’t wait to read the book. thank you for the giveaway! Love to win your basket! I shared it on Facebook! Thanks, I’ll make sure you get an extra entry. All kinds of relationships are important. I know my friendship with my sisters is one of the most important. Thanks, Jan. I’ll put you down for 2 entries. I wish more people knew how wonderful Christian Fiction is. Thanks for your comments. This giveaway is amazing. What a thrill! Thank you for the opportunity. Lillian, Loved your post ! It is so true we need to support each other and friends fill a gap that is often left by family. The hardest thing in the world is to feel you are alone. Your books look terrific and would love to read them. Thanks, jackie. With families so scattered these days, friends are more important than ever. Out of 4 children, I’m the only one who lives in our home state. Hi, Lillian. I just re-tweeted your contest announcement on Twitter and would be thrilled to win your backlist of books. Thanks for the opportunity to participate in the contest. Thanks Sybil. I’ll put an extra entry in for you. I’m so glad I found your blog, I can’t wait to read your books! There’s nothing like a good suspense to get your blood pumping!! Thanks for the great giveaway!! Thanks, Deboorah. I’m glad you enjoyed. I’m now following your blog. Please enter me in the giveaway. I enjoyed reading your blog and your books sound like books I would enjoy reading. Thanks for the opportunity to win your contest–it would truly be an honor to be chosen to win. Thanks! Thanks for entering, Vicki and Jon Good luck. Romance? A much used word for so many things. My husband of 53 years went to be with the Lord Jesus on Christmas Eve. During this past few weeks, memories have flooded me. Little things that mean so much. A note. A bracelet. A necklace. At the time they were little things but now they are big reminders of the giving heart of the one I loved and was privileged to love. An all encompassing romance included the hard times as well as the good times. Marjorie, I am so sorry for your loss. I can’t even imagine the pain. God bless you and comfort you.